RIM to Offer Email Attachments Viewing for Blackberry | BlackBerry Blast! Xerox's mDoc(TM) offering further extends the value of the BlackBerry platform by providing printing and faxing of email attachments. In addition, mDoc provides BlackBerry users access to documents residing on enterprise servers and the ability to print, view, fax or email these documents while mobile. For example, sales professionals will be given the opportunity to improve customer response time with fingertip access to important documents such as contracts and invoices and strengthen relationships with the ability to personalize communications through customizable forms with pre-defined fields. Xerox is currently engineering an enhanced document viewing feature to be included in future offerings, providing graphics and text that are not only crisp and clear, but require minimal network bandwidth, providing significant cost savings. Research In Motion Limited is a leading designer, manufacturer and marketer of innovative wireless solutions for the mobile communications market. Through development and integration of hardware, software and services, RIM provides solutions for seamless access to time-sensitive information including email, messaging, Internet and intranet-based applications. RIM technology also enables a broad array of third party developers and manufacturers around the world to enhance their products and services with wireless connectivity. 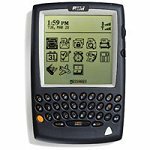 RIM's portfolio of award-winning products includes the RIM Wireless Handheld(TM) product line, the BlackBerry(TM) wireless solution, embedded radio-modems and software development tools. Founded in 1984 and based in Waterloo, Ontario RIM operates offices in Canada, the United States and Europe. RIM is listed on the Nasdaq Stock Market (Nasdaq: RIMM - News) and the Toronto Stock Exchange (TSX: RIM - News). For more information, visit www.rim.net. Investors may contact investor_relations@rim.net. Customers may contact info@rim.net. The BlackBerry and RIM families of related marks, images and symbols are the exclusive properties of Research In Motion Limited. All other brands, products and company names mentioned herein may be trademarks or registered trademarks of their respective holders. Forward-looking statements in this news release are made pursuant to the "safe harbor" provisions of the United States Private Securities Litigation Reform Act of 1995. Investors are cautioned that such forward-looking statements involve risks and uncertainties, including, without limitation, risks relating to possible product defects and product liability, risks related to international sales and potential foreign currency exchange fluctuations, continued acceptance of RIM's products, increased levels of competition, technological changes, dependence on intellectual property rights and other risks detailed from time to time in RIM's periodic reports filed with the United States Securities and Exchange Commission and other regulatory authorities.